Experience the Newest, Biggest, Longest and Most Exciting Zip Line Adventure Course in Door County With Over 2000’ of Heart Pounding Excitement! Located just North of Baileys Harbor off Hwy 57, the 20 acre adventure course borders The Ridges Sanctuary. The adventure begins at the top of a 35′ free standing tower which offers incredible panoramic views of the Sanctuary’s ecologically diverse landscape. Take in the view of Moonlight Bay and the tree tops below before you launch yourself into the breathtaking forest canopy below. Lakeshore Adventures is very proud to offer you the highest quality guided zip line and canopy tour in Door County. The Ridges Sanctuary protects over 1000 acres of the most biologically diverse land in Wisconsin. The Sanctuary is named for its distinctive topography of a series of 30 ridges and swales formed by the movement of Lake Michigan over the past 1400 years. 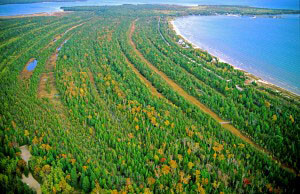 This ridge-swale complex provides a wide range of environmental conditions, from open beach to densely shaded conifer forest. At Lakeshore Adventures Zip Line, safety is the primary concern. Our Zip Line Adventure Course is equipped with ZIP STOP brake systems. 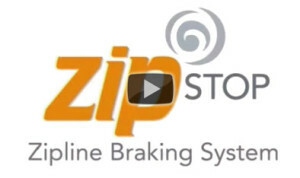 Zip Stop brakes are cutting edge zip line braking technology. No hand braking, static line stopping or other less desirable methods to slow the zip-liner down. The Zip Stop system is a fully automated, magnetic braking system that stops every zipper safely and comfortably! Lakeshore Adventures Canopy Tours follows ACCT standards! The Association for Challenge Course Technology (ACCT) is recognized as the leading professional resource for those who create effective challenge course, canopy/zip line tour and aerial adventure/trekking park facilities and programs that serve the public and/or facilitate learning and positive change in individuals, groups and communities. ACCT establishes and promotes the standard of performance and measure of excellence that defines professional practice and effective challenge course programs. ACCT develops, refines and publishes standards for design, performance, development and advocates globally for the challenge course canopy/zip line tour and aerial adventure/trekking park community. Click on the ACCT logo to learn more.